efficiency, advanced analytics, and exploration and discovery. rather than to a passive store. 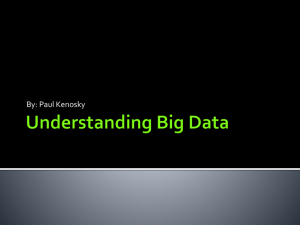 can leverage historic models derived from data being analyzed at rest. from a wide variety of data sources. 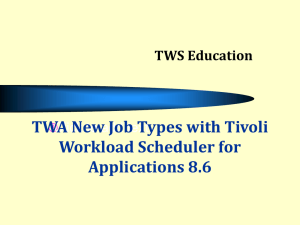 improve operational and strategic insights and decision making. work on other critical projects. users to visualize it in several ways. 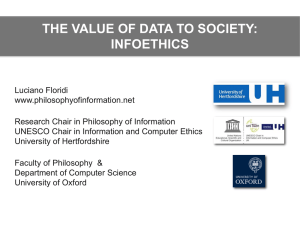 macros address common information discovery needs. 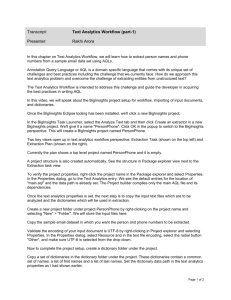 within the InfoSphere BigInsights Eclipse tooling. Figure 1. 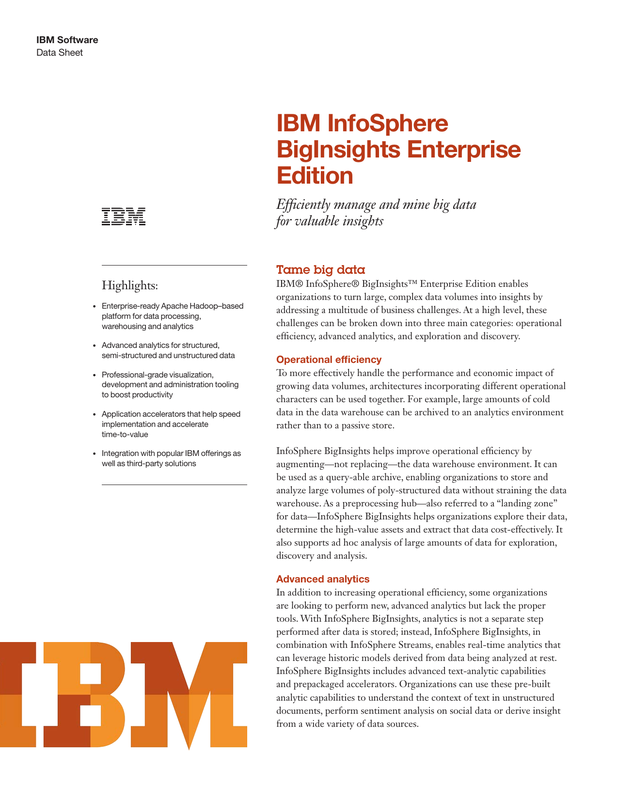 InfoSphere BigInsights adds enterprise capabilities to opensource components. deliver results and insights tailored to specific business needs. 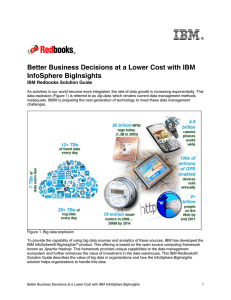 BigInsights can directly ingest unstructured data. 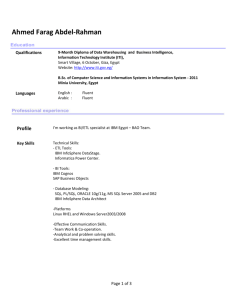 an InfoSphere DataStage extract/transform/load (ETL) job. Oracle, Microsoft SQL Server, MySQL and Teradata. current customer of, products owned and product interest. customer acquisition and targeted marketing campaigns. compatibility within an enterprise environment. that leverage existing enterprise data. options that help ensure data security and privacy. 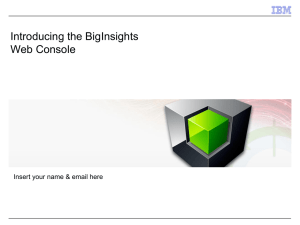 Modules (PAM) for the InfoSphere BigInsights web console. making it easy to set access rights for groups of users. decision making, gain better insight and manage performance. gather and organize information from multiple sources. 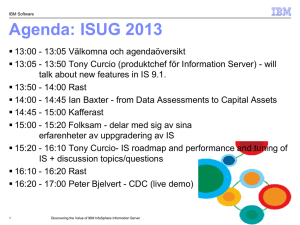 way they manage traditional structured data sources. features that are designed for greater ease of use. 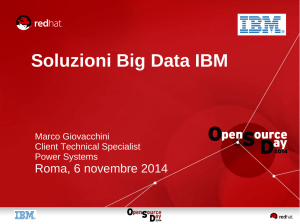 management to big data environments. around big data security by offering tighter access control. availability with seamless, automatic and transparent failover. emails, phone numbers and so on from within BigSheets. Group B.V., an IBM Company. trademarks of Oracle and/or its affiliates. country in which IBM operates. and conditions of the agreements under which they are provided. and compressed data and will vary and may be less than stated. 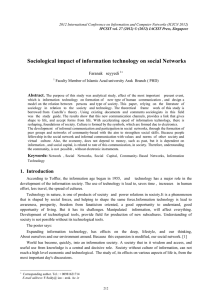 Sociological impact of information technology on social Networks Abstract.